This tutorial will cover Revolute Joints and Cylindrical Joints to illustrate common joints you can expect to use. The Revolute Joint move locates two axes to one another controlling four DoFs (degrees of freedom) and uses a pair of plane constraints to control a fifth, translation, DoF. The Cylindrical Joint move locates two axes to one another controlling four DoFs. Additional joints include Prismatic, Spherical, and Planar. Create a Revolute Joint between the Base and the Crankshaft. On the DCS Mechanical toolbar, expand the Joints toolbar and select Revolute Joint. Name the joint "Crankshaft_to_Base_Rev" and add the Description "aligned by an axis through both ends". To select the Object/Target Features, the blue highlight bar should be in the Object Features field. Select only one of the cylindrical handles of the Crankshaft and the corresponding cylindrical holes in the Base in the graphics window. To select the Object/Target Features, Click "+" button next to the Object Features and select both cylindrical handles of the Crankshaft again Click the "+" button next to Target Features and select the corresponding cylindrical holes in the Base in the graphics window. For the Plane Constraints, select one of the outside surfaces of the Crankshaft and the corresponding inside wall of the Base in the graphics window. Make sure the the blue highlight bar is at the second line in the Object Features field. Select the other cylindrical handle of the Crankshaft and the corresponding cylindrical hole in the Base in the graphics window. The Feature tab should now match the picture below. Under the Move Parts tab, check that the Crankshaft is listed first and the Base is listed second. Modify if necessary. Under the Floating tab, turn floating off by unchecking the Active box for both hole-pin pairs. Nominal Build the model. The Crankshaft should move to the Base. Click the Animation mode icon. The model should change to Creation mode and separate. 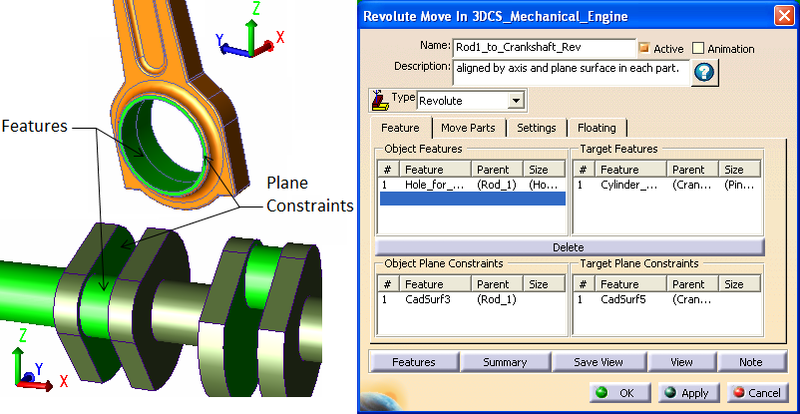 Create a Revolute Joint between Rod_1 and the Crankshaft. 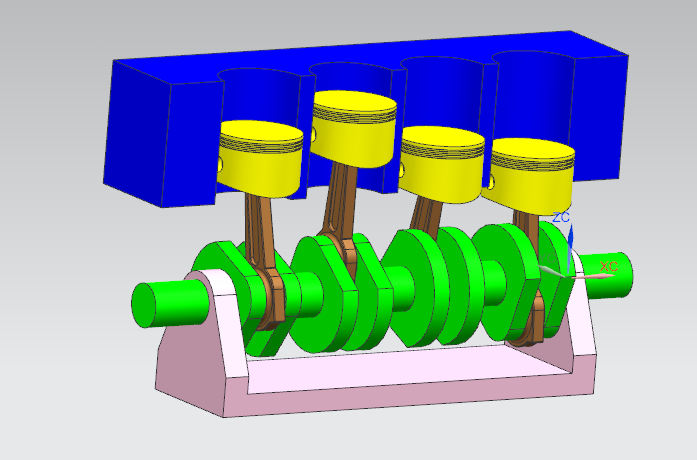 Name the joint "Rod1_to_Crankshaft_Rev" and add the Description "aligned by axis and plane surface in each part". For Object/Target Features, select the larger cylindrical hole in Rod_1 and the inner cylindrical locator of the Crankshaft from the graphics window (see image below). 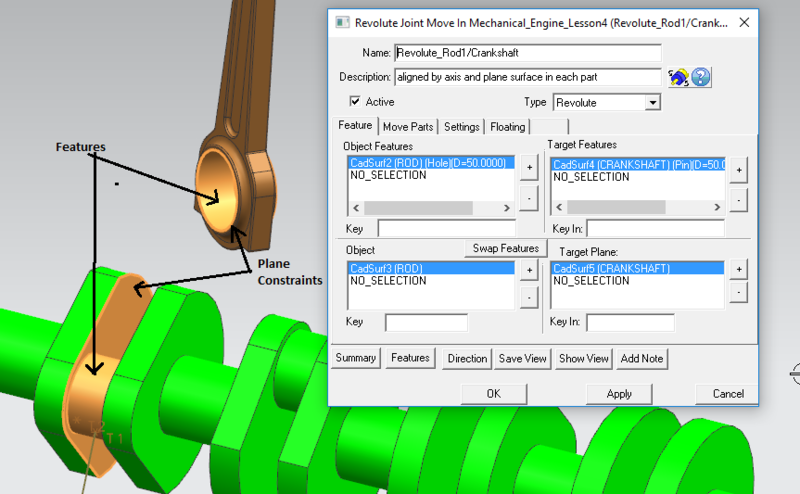 For Object/Target Plane Constraints, select small flat surface outside the hole on Rod_1 and the inner flat surface of the Crankshaft in the graphics window (see image below). Under the Move Parts tab, check that both the Rod_1 and Crankshaft are listed in order. Modify if necessary. Under the Floating tab, turn floating off by unchecking the Active box. Repeat these steps to create a Revolute Joint for each of the remaining three Rod parts to the Crankshaft. Nominal Build the model. 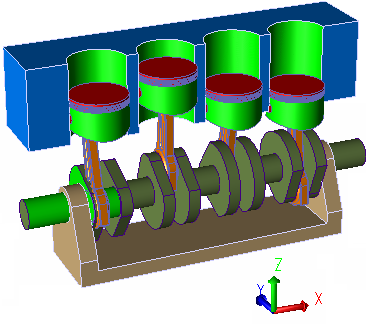 The Crankshaft should move to the Base and the four Rods should move to the Crankshaft. 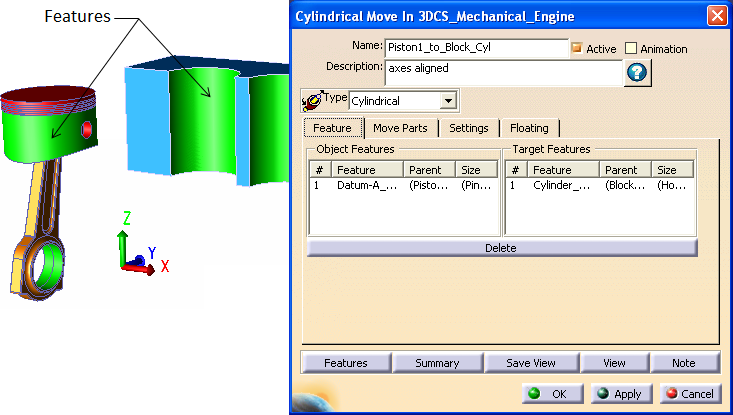 Create a Cylindrical Joint between Piston_1 and the Block. On the DCS Mechanical toolbar, expand the Joints toolbar and select Cylindrical Joint. Name the joint "Piston1_to_Block_Cyl" and add the Description "axes aligned". For Object/Target Features, select the outer cylindrical surface of Piston_1 and the first semi-cylinder of the Block (see image below). Under the Move Parts tab, check that both Piston_1 and the Block_1 are listed in order. Modify if necessary. Repeat these steps to create a Cylindrical Joint for each of the remaining three Pistons. Nominal Build the model. The Crankshaft should move to the Base, the four Rods should move to the Crankshaft, and the four Pistons should align to the Block. Create a Cylindrical Constraint between Piston_1 and Rod_1. 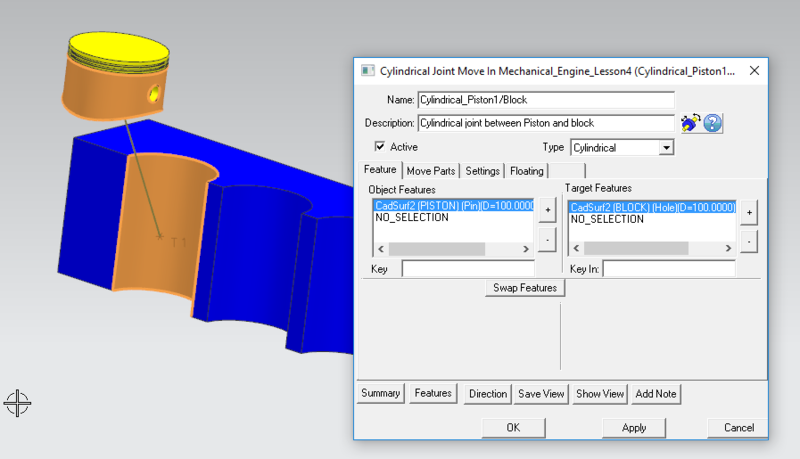 On the DCS Mechanical toolbar, expand the Constraints toolbar and select Cylindrical Joint. 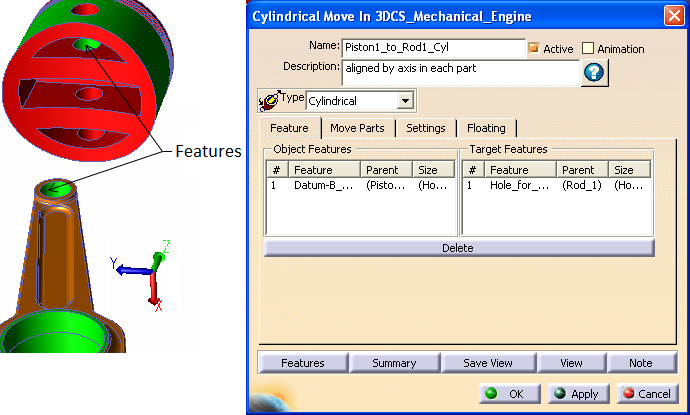 Name the move "Piston1_to_Rod1_Cyl" and add the Description "aligned by axis in each part"
For Object/Target Features, select an inner cylindrical hole on Piston_1 and the small top cylindrical hole on Rod_1 in the graphics window (see image below). Under the Move Parts tab, check that both Piston_1 and Rod_1 are listed in order. Modify if necessary. Go to Settings tab and select [Yes] for the Drop DOF setting. Repeat these steps to create a Cylindrical Constraint for each of the remaining three Piston to Rod connections. Turn points off (hide them) by clicking Show Points if desired. Turn mesh off (hide them) by clicking Show Mesh if desired. Click on Nominal Build to build the model. It should resemble the example below. Joints relate one part to another based on part geometry. Degrees of freedom are constrained by axes and planes depending on the specified type of joint. Joints form the basis for motion moves by defining the pathway for motion while restricting certain directions due to physical boundaries.